In case you didn't know, this Sunday is the annual Academy Awards show aka the Oscars aka my personal Superbowl/ World Series/ World Cup. I don't remember a time when I didn't watch the Oscars, it will always be the epitome of celebrity wonder & merriment for me. 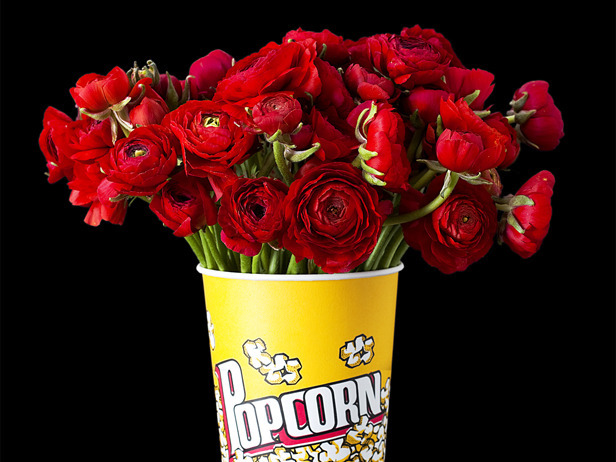 Strangely enough, as obsessed as I am with the Oscars, I've never had a huge watching party. The past couple of years I've been known to hang out with a bottle of pinot grigio and rapid fire text my friends who love this awards show as much as me. This year I am doing an Oscar pool to select winners but still no party... maybe next year? But if you are throwing a bash for 2012, I do have some ideas. I did a post on Oscar party decor last year and this year I'm excited to showcase a few more options for the three main areas of a great party; food, drink and decor. Enjoy! #1. Food. Just because our favorite celebs have been on a strict diet for weeks prepping for the Oscars, doesn't mean we can't enjoy some delicious indulgences! 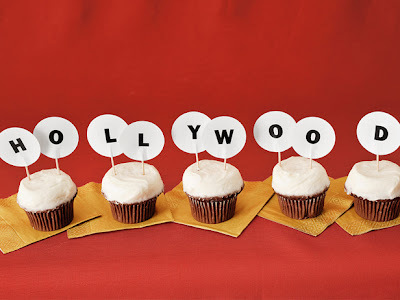 A cute idea of making food named after the nominated movies and actors is always a party hit and this year served up a bunch of inspiration. Try out a a fresh fruit spread (inspired by The Descendants), mini hot dogs (inspired by Moneyball), chocolate pie (inspired by The Help), and what movie awards show would be complete without popcorn? Try this easy recipe for popcorn balls as a twist on breaking out the usual bucket of popcorn. #2. Drink. Of course champagne is the standard drink for celebration. But if you are looking for to toast the nominees in a flashier style, try out some fun cocktails. Pizzazzerie posted some fun cocktail recipes, including the (Billy) Crystal Cosmo, Sweet Revenge (inspired by The Girl With The Dragon Tattoo) and The Golden Era (inspired by Midnight In Paris). Or try out the Silent Martini (inspired by The Artist) created by The Vancouver Sun. Cheers! #3. Decor. Hostess With The Mostess blog never disappoints, here is this year's list of nominee printable decor. You don't need to go all out to create a special atmosphere, as seen by Jackie Fogartie Events displayed with using popcorn buckets as flower vases or posting cute movie signs in cupcakes. Have a great time and let the best nominee win!